The University of Oxford has 38 Colleges and six Permanent Private Halls (PPHs) of religious foundation. Colleges and PPHs are autonomous self-governing corporations within the university, and all teaching staff and students studying for a degree at the university must belong to one of the colleges or PPHs. These colleges are not only houses of residence, but have substantial responsibility for teaching undergraduate students. Generally tutorials (one of the main methods of teaching in Oxford) and classes are the responsibility of colleges, while lectures, examinations, laboratories, and the central library are run by the university. Most colleges take both graduates and undergraduates, but several are for graduates only. Undergraduate and graduate students may name preferred colleges in their applications. For undergraduate students, an increasing number of departments practise reallocation to ensure that the ratios between potential students and subject places available at each college are as uniform as possible. For the Department of Physics, reallocation is done on a random basis after a shortlist of candidates is drawn upon and before candidates are invited for interviews at the university. For graduate students, many colleges express a preference for candidates who plan to undertake research in an area of interest of one of its fellows. St Hugh's College, for example, states that it accepts graduate students in most subjects, principally those in the fields of interest of the Fellows of the college. A typical college consists of a hall for dining, a chapel, a library, a college bar, senior, middle (postgraduate), and junior common rooms, rooms for 200–400 undergraduates as well as lodgings for the head of the college and other dons. College buildings range from medieval to modern, but most are made up of interlinked quadrangles (courtyards), with a porter's lodge controlling entry from the outside. 2008 saw the first modern merger of colleges, with Green College and Templeton College merging to form Green Templeton College. This reduced the number of Colleges of the University from 39 to 38. The number of PPHs also reduced in 2008, when Greyfriars closed down. The collegiate system arose because Oxford University came into existence through the gradual agglomeration of numerous independent institutions. Over the centuries several different types of college have emerged and disappeared. The first academic houses were monastic halls. Of the dozens established during the 12th–15th centuries, none survived the Reformation. The modern Dominican permanent private hall of Blackfriars (1921) is a descendant of the original (1221), and is sometimes described as heir to the oldest tradition of teaching in Oxford. As the university took shape, friction between the hundreds of students living where and how they pleased led to a decree that all undergraduates would have to reside in approved halls. What eventually put an end to the medieval halls was the emergence of colleges. Often generously endowed and with permanent teaching staff, the colleges were originally the preserve of graduate students. However, once they began accepting fee-paying undergraduates in the 14th century, the halls' days were numbered. Of the hundreds of Aularian houses (from the Latin for "hall") that sprang up, only St Edmund Hall (c. 1225) remains. The oldest colleges are University College, Balliol, and Merton, established between 1249 and 1264, although there is some dispute over the exact order and precisely when each began teaching. The fourth oldest college is Exeter, founded in 1314, and the fifth is Oriel, founded in 1326. The most recent new foundation is Kellogg College (1990), whilst the most recent overall is Green Templeton College (a merger of two existing colleges in 2008). Women entered the university in 1879, with the opening of Lady Margaret Hall and Somerville College, becoming members of the University (and thus eligible to receive degrees) in 1920. Other women's colleges before integration were St Anne's, St Hilda's and St Hugh's. In 1974 the first men's colleges to admit women were Brasenose, Hertford, Jesus College, St Catherine's and Wadham. By 2008 all colleges had become co-residential, although one of the Permanent Private Halls, St Benet's Hall, did not start to admit postgraduate women until Michaelmas term 2014 and women undergraduates until Michaelmas 2016. Some colleges, such as Kellogg, Linacre, Nuffield, St Antony's, St Cross and Wolfson only admit postgraduate students. All Souls admits only Fellows. Harris Manchester is intended for "mature students" with a minimum age of 21. In 2018 it was announced that a new, non-residential, graduate college of the University, Parks College, would be established using the premises of the Radcliffe Science Library, opening in 2020. Kellogg and St Cross are the only Oxford colleges without a royal charter. They are officially societies of the university rather than independent colleges and both are considered departments of the university for accounting purposes. The Oxford University Act 1854 and the university statute De aulis privatis (On private Halls) of 1855, allowed any Master of Arts aged at least 28 years to open a private hall after obtaining a licence to do so. One such was Charsley's Hall. The Universities Tests Act 1871 opened all university degrees and positions to men who were not members of the Church of England (subject to safeguards for religious instruction and worship), which made it possible for Catholics and Non-conformists to open private halls. The first Catholic private halls were Clarke's Hall (now Campion Hall), opened by the Jesuit Order in 1896 and Hunter Blair's Hall (now St Benet's Hall) opened by the Benedictine Order in 1899. In 1918 the university passed a statute to allow private halls which were not run for profit to become permanent private halls and the two halls took their current names. ^ a b c d The financial statements of Kellogg College and St Cross College, due to them not having Royal Charters, are incorporated into the university's own accounts. ^ a b Blackfriars Hall is operated by the English Province of the Order of Preachers, part of the Dominican Order, who also run several priories and other charitable operations. The hall does not have assets or endowments specific to it that shown in the order's accounts. ^ a b Campion Hall is one of several institutions operated by the Society Of Jesus Trust Of 1929 For Roman Catholic Purposes. The hall does not have assets or endowments specific to it that are shown in the society's accounts. Each college and permanent private hall has its own arms, although in some cases these were assumed rather than granted by the College of Arms. Under King Henry VIII Oxford colleges were granted exemption from having their arms granted by the College of Arms; and some, like Lady Margaret Hall, have chosen to take advantage of this exemption, whilst others, such as Oriel, despite having used the arms for many centuries, have recently elected to have the arms granted officially. The blazons below are taken from the Oxford University Calendar unless otherwise indicated. Shields are emblazoned as commonly drawn, and notable inconsistencies between blazons and emblazons (the shields as drawn) are indicated. Each college also has its own colours used on items such as scarves and rowing blades. Or, a chevron between three cinquefoils gules. Azure a lion rampant argent, crowned or, impaling gules, an orle argent. Sable, on a cross engrailed argent, a lion passant gules between four leopards' faces azure, on a chief or a rose of the third, seeded or, barbed vert, between two Cornish choughs proper. Tierced per pale: (1) Azure, a pelican with wings endorsed vulning herself or; (2) Argent, thereon an escutcheon charged with the arms of the See of Winchester (i.e. gules, two keys addorsed in bend, the uppermost or, the other argent, a sword interposed between them in bend sinister of the third, pommel and hilt gold; the escutcheon ensigned with a mitre of the last); (3) Sable, a chevron or between three owls argent, on a chief of the second as many roses gules, seeded of the second, barbed vert. Argent, two bends nebuly within a bordure sable charged with eight pairs of keys, addorsed and interlaced in the rings, the wards upwards, or. Or between two flaunches vert on each a nautilus shell the aperture outwards or a rod of Aesculapius sable the serpent azure. Gules, two Torches inflamed in saltire proper; on a Chief Argent, between Two Roses of a field barbed and seeded an open Book also proper. Gules, a stag's head caboshed argent, attired, and between the attires a cross patty fitchy at the foot, or. Vert, three stags trippant argent attired or. Argent, a chevron engrailed gules, on a chief azure three mullets pierced or. Per pale indented argent and azure on the argent a chevron enhanced gules in base a book azure leaved argent on the azure an ear of wheat palewise or the whole within a bordure gules. Or, on a chevron between in chief two talbots passant and in base a bell all azure, a portcullis of the field. Sable an open Book proper edged or bound gules the dexter page charged with the Greek letter alpha the sinister page charged with the Greek letter omega both sable the whole between three escallops argent. Lozengy ermine and sable, on a chief of the second three lilies argent slipped and seeded or. Gules an open book proper inscribed DEUS LOCUTUS EST NOBIS IN FILIO in letters sable bound argent edged and clasped or between three cross crosslets or. Or, three chevronels party per pale, the first and third azure and gules, the second gules and azure. Argent, two chevronels sable between three roses gules, seeded or, barbed vert. Gules, three lions passant guardant in pale or within a bordure engrailed argent. 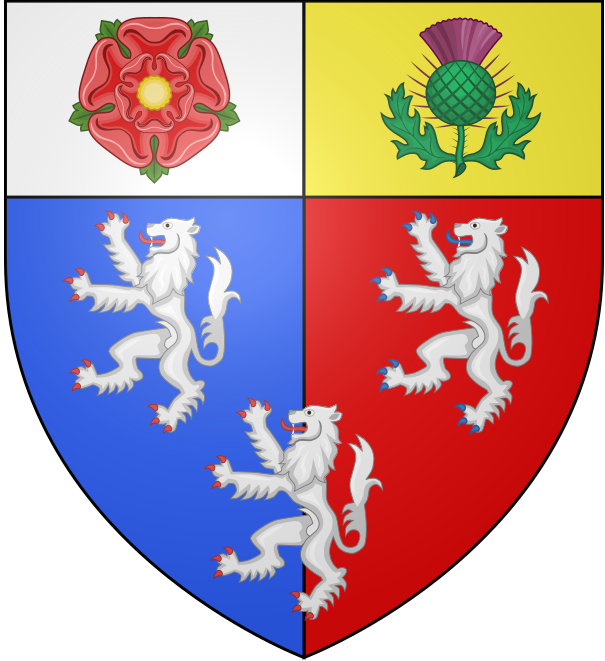 Per pale azure and gules, three lions rampant, two and one, argent, on a chief per pale argent and or, in the first a rose gules, seeded or, barbed vert in the second a thistle of Scotland proper. Argent, three mullets in chevron reversed gules, between six crosses crosslet fitched sable. Gules, on a chevron between in chief two lions' heads erased argent, and in base a sword of the second pummelled and kilt or and enfiled with a wreath of laurel proper, three ravens. Or on a chevron between three tau crosses gules as many pierced mullets of the field. Sable a saltire ermine between four Catherine wheels or. Argent a cross potent purpure a quarter counterchanged. Or, a cross patonce gules cantoned by four Cornish choughs proper. Azure on a fess or between in chief two unicorns' heads couped and in base a coiled serpent argent three estoiles gules. Azure a saltire ermine between four fleurs-de-lis or. Gules, on a bordure sable eight estoiles or; on a canton ermine a lion rampant of the second; on the fess point an annulet of the third. Per pale vert and argent, to the dexter two keys in saltire or surmounted by a triple towered castle argent masoned sable (representing Oxford bailey) and on the sinister a cross gules surmounted by a mitre or between four martlets sable (for Chavasse), the whole within a bordure or. Party per pale or and azure, on a chevron between three griffins heads erased four fleurs-de-lys, all counter-changed of the field. Azure, a cross patonce between five martlets or. Gules, a chevron between 3 roses argent, seeded or, barbed vert, impaling gules, a bend or between two escallops argent. Per pale gules and or on a chevron between three roses two pears all countercharged the roses barbed and seeded proper. Argent on a cross gules an open Bible proper irradiated or the pages inscribed with the words DOMINUS JESUS in letters sable on a chief wavy azure fish or. Per fesse dancetté or and azure, a chief per pale gules and of the second, charged on the dexter with two keys in saltire or and argent, and on the sinister with a cross flory between five martlets of the first. Gules a celestial crown between three bezants two and one or, on a chief sable an apostolic eagle between two crosses crosslet or. ^ Brasenose: the blazon of the arms of the See of Lincoln given here differs from that at Lincoln College; the two forms are simply interpretations of the simpler blazon gules, two lions passant gardant or, in a chief azure Our Lady sitting with her Babe, crown and sceptre of the second. ^ Lincoln: although the three stags are blazoned as trippant argent attired or they are universally drawn as statant or. See also note on Brasenose above. ^ Nuffield: uniquely among the Oxford colleges the blazon of Nuffield recorded in the University Calendar also describes its crest. ^ Queens: the depiction of the pierced mullet is quite variable; a mullet of six points is common and the piercing is sometimes indicated schematically. ^ Worcester: although the six martlets are blazoned as gules (red) they are usually (but not always) drawn as sable (black). ^ Blackfriars: the blazon used here is that of the Dominican Order. Blackfriars also uses their simpler shield, blazoned as sable, a pile inverted argent. ^ Campion: the phrase billets of the Weld used in the Calendar appears to be a misprint for billets of the field. ^ Wycliffe: the blazon used here is simply a description of the shield as usually drawn. The senior member of each college is an officer known generically as the Head of House. His or her specific title varies from college to college as indicated in the list below. While the Head of House will usually be an academic, it is not uncommon for a person to be appointed who has had a distinguished career outside academic circles. For a list of current Heads of Houses, see Heads of Houses. Warden: All Souls, Keble, Merton, New College, Nuffield, St Antony’s, and Wadham. Until 2004, the President of Templeton was both Head of House and Chairman of the Governing Body. In 2004, the college statutes were amended so that these roles were separated. The Dean was the Head of House until 2008. When the college merged with Green, the Head of the new Green Templeton assumed the title of Principal. The Dean of Christ Church is head of both the college and the cathedral. The President of Kellogg is also Director of the Department for Continuing Education. As of 2018 the accounts of the Oxford colleges included total assets of £6.3 billion. This figure does not reflect all the assets held by the colleges as their accounts do not include the cost or value of many of their main sites or heritage assets such as works of art or libraries. The total endowments of the colleges were £4.9 billion as of 2018. Individual college endowments ranged from £1.1m (Green Templeton) to £551.5 million (St John's). For some years, an unofficial ranking of undergraduate colleges by performance in Final Honour Schools examinations, known as the Norrington Table, was published annually. As the table only took into account the examination results for the year of publication, college rankings could fluctuate considerably. Beginning in 2005, the University of Oxford started publishing a list of colleges classified by a "Norrington Score", effectively replicating the Norrington Table. The university claims to have published the results "in the interests of openness". Although the university says that the college listings are "not very significant", the 2005 table was the first Norrington Table with official data and also probably the first to be accurate. Dame Fiona Caldicott, the Chairman of the Conference of Colleges, said that in previous years some students had used the Data Protection Act 1998 to ensure their results were not published, rendering the unofficial tables inaccurate. ^ "Admissions procedures for Physics courses". The University of Oxford Department of Physics. Retrieved 11 June 2016. ^ "Graduate study at St Hugh's". St Hugh's College, University of Oxford. Archived from the original on 2 June 2016. Retrieved 11 June 2016. ^ "The merger". Green Templeton College, University of Oxford. Retrieved 11 June 2016. ^ "Organisation". University of Oxford. Retrieved 11 June 2016. ^ "Closure of Greyfriars: University Statement" (Press release). University of Oxford. 25 October 2007. Archived from the original on 29 October 2013. Retrieved 11 June 2016. ^ "A College for students 21 and over". Harris Manchester College. Archived from the original on 8 April 2016. Retrieved 12 June 2016. 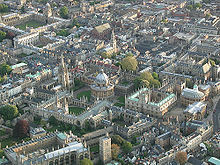 ^ "Oxford unveils plans for new graduate college". University of Oxford. 7 December 2018. Retrieved 7 December 2018. ^ "Statute V: Colleges, Societies, and Permanent Private Halls". University of Oxford. Retrieved 20 August 2018. ^ "Financial Statements of the Oxford Colleges (2016-17)". University of Oxford. Retrieved 18 August 2018. ^ Statuta Universitatis Oxoniensis [Oxford University Statutes] (in Latin). University of Oxford. 1876. pp. 275–279. Retrieved 6 September 2018. ^ William Geddie, Chambers's Encyclopaedia, Volume 7 (1874), p. 174: "To these may be added Charsley's Hall, being a private hall under the mastership of WH Charsley, in virtue of a statute passed in 1854..."
^ a b "Victoria County History". british-history.ac.uk. Retrieved 7 September 2018. ^ "Victoria County History". british-history.ac.uk. Retrieved 7 September 2018. ^ a b "Financial Statements of the Oxford Colleges (2017-18) | University of Oxford". Ox.ac.uk. 31 July 2018. Retrieved 5 March 2019. ^ a b c d e f g h i j k l "Student Numbers 2015" (PDF). Oxford University Gazette. 146 (5124 Supplement (1)). p. 350. ^ a b "All Souls College : Annual Report and Financial Statements for the year ended 31 July 2018" (PDF). ox.ac.uk. p. 50. Retrieved 5 March 2019. ^ a b "Balliol College : Annual Report and Financial Statements for the year ended 31 July 2018" (PDF). ox.ac.uk. p. 22. Retrieved 5 March 2019. ^ a b "Brasenose College : Trustee Report and Accounts : For the year ended 31 July 2018" (PDF). ox.ac.uk. p. 25. Retrieved 5 March 2019. ^ a b "Christ Church Oxford : Annual Report and Financial Statements : Year ended 31 July 2018" (PDF). ox.ac.uk. p. 21. Retrieved 5 March 2019. ^ a b "Corpus Christi College, Oxford : Annual Report & Financial Statements : Year ended 31 July 2018" (PDF). ox.ac.uk. p. 43. Retrieved 5 March 2019. ^ a b "Exeter College : Annual Report and Financial Statements : Year ended 31 July 2018" (PDF). ox.ac.uk. p. 25. Retrieved 5 March 2019. ^ a b "Green Templeton College : Annual Report and Financial Statements : Year ended 31 July 2018" (PDF). ox.ac.uk. p. 20. Retrieved 5 March 2019. ^ a b "Harris Manchester College : Annual Report and Financial Statements : Year ended 31 July 2018" (PDF). ox.ac.uk. p. 20. Retrieved 5 March 2019. ^ a b "Hertford College : Annual Report and Financial Statements : Year ended 31 July 2018" (PDF). ox.ac.uk. p. 23. Retrieved 5 March 2019. ^ a b "Jesus College Oxford : Annual Report and Financial Statements : Year ended 31 July 2018" (PDF). ox.ac.uk. p. 20. Retrieved 5 March 2019. ^ a b "Keble College : Annual Report and Financial Statements : Year ended 31 July 2018" (PDF). ox.ac.uk. p. 22. Retrieved 5 March 2019. ^ a b "Lady Margaret Hall : Annual Report and Financial Statements : Year ended 31 July 2018" (PDF). ox.ac.uk. p. 27. Retrieved 5 March 2019. ^ a b "Linacre College : Annual Report and Financial Statements : Year ended 31 July 2018" (PDF). ox.ac.uk. p. 23. Retrieved 5 March 2019. ^ a b "Lincoln College : Annual Report and Financial Statements : Year ended 31 July 2018" (PDF). ox.ac.uk. p. 37. Retrieved 5 March 2019. ^ a b "Magdalen College : Report and Financial Statements for the Year Ended 31 July 2018" (PDF). ox.ac.uk. p. 26. Retrieved 5 March 2019. ^ a b "Mansfield College : Annual Report and Financial Statements : Year ended 31 July 2018" (PDF). ox.ac.uk. p. 19. Retrieved 5 March 2019. ^ a b "Merton College : Annual Report and Financial Statements : Year ended 31 July 2018" (PDF). ox.ac.uk. p. 40. Retrieved 5 March 2019. ^ a b "New College : Annual Report and Financial Statements : Year ended 31 July 2018" (PDF). ox.ac.uk. p. 20. Retrieved 5 March 2019. ^ a b "Nuffield College University of Oxford : Annual Report and Financial Statements : Year ended 31 July 2018" (PDF). ox.ac.uk. p. 21. Retrieved 5 March 2019. ^ a b "Oriel College : Trustees' Annual Report & Financial Statements : Year ended 31 July 2018" (PDF). ox.ac.uk. p. 35. Retrieved 5 March 2019. ^ a b "Pembroke College : Annual Report and Financial Statements : Year ended 31 July 2018" (PDF). ox.ac.uk. p. 23. Retrieved 5 March 2019. ^ a b "The Queen's College Oxford : Annual Report and Financial Statements : Year ended 31 July 2018" (PDF). ox.ac.uk. p. 20. Retrieved 5 March 2019. ^ a b "St Anne's College : Annual Report and Financial Statements : Year ended 31 July 2018" (PDF). ox.ac.uk. p. 27. Retrieved 5 March 2019. ^ a b "St Antony's College : Annual Report and Financial Statements : Year ended 31 July 2018" (PDF). ox.ac.uk. p. 20. Retrieved 5 March 2019. ^ a b "St Catherine's College : Financial Statements : Year ended 31 July 2018" (PDF). ox.ac.uk. p. 22. Retrieved 5 March 2019. ^ a b "St Edmund Hall : Annual Report and Financial Statements : Year ended 31 July 2018" (PDF). ox.ac.uk. p. 19. Retrieved 5 March 2019. ^ a b "St Hilda's College : Annual Report and Financial Statements : Year ended 31 July 2018" (PDF). ox.ac.uk. p. 25. Retrieved 5 March 2019. ^ a b "St Hugh's College : Annual Report and Financial Statements : Year ended 31 July 2018" (PDF). ox.ac.uk. p. 25. Retrieved 5 March 2019. ^ a b c "Saint John Baptist College in the University of Oxford : Annual Report and Financial Statements : Year ended 31 July 2018" (PDF). ox.ac.uk. p. 18. Retrieved 5 March 2019. ^ a b "St Peter's College University of Oxford : Annual Report & Financial Statements : For the year ended 31 July 2018" (PDF). ox.ac.uk. p. 27. Retrieved 5 March 2019. ^ a b "Somerville College : Annual Report and Financial Statements : Year ended 31 July 2018" (PDF). ox.ac.uk. p. 21. Retrieved 5 March 2019. ^ a b "Trinity College : Annual Report and Financial Statements : Year ended 31 July 2018" (PDF). ox.ac.uk. p. 19. Retrieved 5 March 2019. ^ a b "University College Oxford : Annual Report and Financial Statements : Year ended 31 July 2018" (PDF). ox.ac.uk. p. 28. Retrieved 5 March 2019. ^ a b "Wadham College : Annual Report and Financial Statements : Year ended 31 July 2018" (PDF). ox.ac.uk. p. 20. Retrieved 5 March 2019. ^ a b "Wolfson College : Annual Report and Financial Statements : Year ended 31 July 2018" (PDF). ox.ac.uk. p. 20. Retrieved 5 March 2019. ^ a b "Worcester College : Annual Report and Financial Statements : Year ended 31 July 2018" (PDF). ox.ac.uk. p. 22. Retrieved 5 March 2019. ^ a b c d "AGGREGATED COLLEGE ACCOUNTS For the year ended 31 July 2018" (PDF). ox.ac.uk. p. 13. Retrieved 5 March 2019. ^ a b "Regent's Park College (Including Creed's Regent's Park) : Accounts for the year ended 31 August 2015" (PDF). charitycommission.gov.uk. p. 7. Retrieved 25 September 2016. ^ a b "The St Benet's Trust : Trustees' report and financial statements : 31st August 2015" (PDF). charitycommission.gov.uk. p. 8. Retrieved 25 September 2016. ^ a b "The Society of St Stephen's House : Financial Statements : For the year ended 30 June 2015" (PDF). charitycommission.gov.uk. p. 6. Retrieved 25 September 2016. ^ a b "Wycliffe Hall : Annual Report and Financial Statements : Year ended 30 June 2015" (PDF). charitycommission.gov.uk. p. 13. Retrieved 25 September 2016. ^ University of Oxford Calendar 2010–2011. Oxford University Press. 2010. ISBN 978-0-19-958663-9. ^ "Boat Club". Christ Church, Oxford. Retrieved 8 June 2016. ^ Hibbert, Christopher, ed. (1988). "Heraldry". The Encyclopaedia of Oxford. London: Macmillan. p. 172. ^ Cite error: The named reference green templeton was invoked but never defined (see the help page). ^ "Oxford publishes college rankings". BBC News. 6 September 2005. Retrieved 30 April 2010. ^ "'Ivy Beer on Ascension Day', Brasenose College". Archived from the original on 1 August 2009. ^ Horan, David (1999). Oxford: A Cultural and Literary Companion. Interlink Books. pp. 151–152. ISBN 1566563488. ^ "Keble into semi-finals" (Official Student Newspaper). The Oxford Student. ^ "St. John's Says Keble Is Not Rival-Worthy Enough" (Official Student Newspaper). The Cherwell.